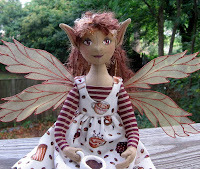 The Fairies Nest - OOAK Cloth Dolls & Fiber Fantasies: Too Darn Hot!! I have been really slack about keeping this blog updated and that needs to change. I've been stuck in the summer doldrums for too long, although in my defense this summer has been hideously hot...NOT one of my favorite seasons! I've been trying to think of the positives of summer, lovely veggies from the garden, no school stuff to worry about, butterflies...and there I'm stuck! There are just so many more things I don't like about summer...sigh...hopefully the heat will break soon. But I have been VERY busy making dolls. Our annual summer homeshow went pretty well. Of course all the money I made was swallowed up the NEXT day by an emergency car repair...another sigh...but at least I had it. 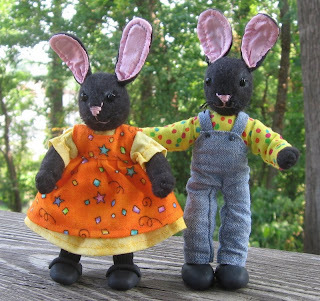 I've added several new dolls to my Etsy site including these two cuties. I'll be adding more over the next couple of weeks so go to the store and check them out! Tag your it! : ) I thought I would play along too. Sarah from the FAE etsy team tagged me. 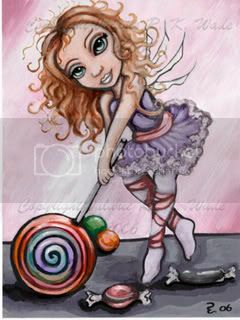 click to view my blog for details on what to fill out and tag more FAE members.